Last night the family went out to my hometown to take care of insurance stuff. More importantly got to see and have dinner with Grandma. 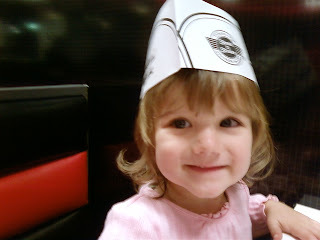 We went had Steak n Shake for dinner. It was kind of late by the time we got there and we were worried that Alyce might be a handful. Our worries were unneeded as Alyce was about as perfect as could be expected. She sat or kneeled in the booth most of the time and didn't fuss when we eventually put her in her highchair. 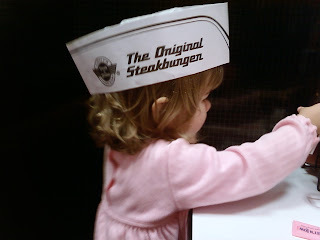 One thing that kept her entertained was a Steak n Shake hat. She modeled it for us in a multitude of different angles. Here are a few pictures of our Steak n Shake model. 0 comments on "Dinner at Steak n Shake"